Hansgrohe presents hand showers featuring the savvy little button: the round Raindance Select S 120 and the Raindance Select E 120 withsmooth corners. Both showers come with three jet types. Your customers can actuate these using the Select button, choosing water that caresses, invigorates or massages. The Select button is installed on the front of the hand shower, so the user can switch between jet types easily, quickly and intuitively while showering. Hansgrohe's innovative feel-good secret: each type of jet comes out of its very own type of nozzles. 1. RainAir. Soft shower rain from large nozzles: with air-enriched water droplets. 2. Rain. 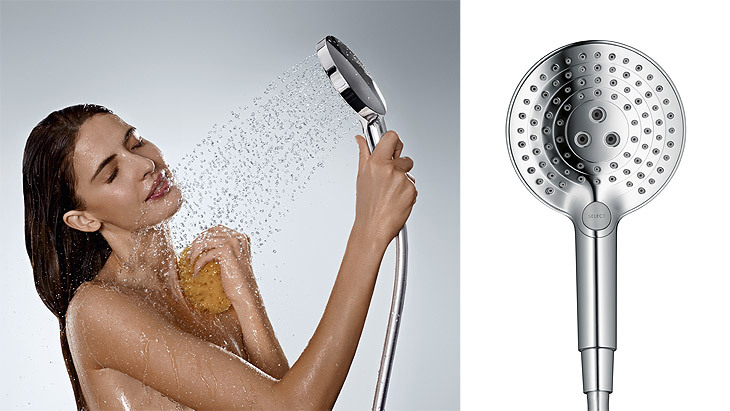 Powerful shower rain from small nozzles: ideal for rinsing out shampoo. 3. Whirl. Concentrated massage spray from rotating nozzles: relieves tension. add comforting serenity to the shower. are pleasantly modern and perfectly suit any bathroom. The new hand showers are easy to install – ideal for upgrading bathrooms quickly and decoratively. They are also attractive from both an ecological and an economical point of view: thanks to intelligent flow limitation. The EcoSmart variant reduces water consumption by up to 40 percent – from 15 to 9 litres per minute. These showers offer a customised pleasurable shower experience for a broad target group. For you this means: excellent sales opportunities. In a study on showering – at the company's in-house spray laboratory – Hansgrohe discovered that there are individual shower types. We have converted the various requirements into jet types. From now on, you can use this knowledge to recommend the ideal shower products to each of your customers.